Khairpur: Sindh Chief Minister Syed Qaim Ali Shah Jillani, while elaborating Sindh’s stance during the National Finance Commission (NFC) meeting, on Sunday regretted the centre’s attitude over the issue of general sales tax (GST) on services. Talking to reporters here at Daraza Sharif after inaugurating the two-day Urs celebration of Hazrat Sachal Sarmast (RA), the chief minister said his government had made it clear that the GST was a provincial subject and asked the Centre to let the provinces collect the GST and take it out of the NFC terms of reference, adding that Sindh’s stand on multiple criteria-based NFC had also got the support of the majority. Qaim hoped a consensus NFC Award would be declared at the end of the day, saying the sub-committees thus formed had been making headway. He lauded the PPP government for taking up the NFC Award, which had been elusive so far and scared the previous governments for 13 years. He also dismissed reports of baton-charge on people at distribution centres of subsidised flour, blaming impatient people for the mismanagement. He urged the people to remain calm as his government was committed to providing people flour at Rs 10 per kg. He termed the law and order situation in the province satisfactory, rejecting the Sindh IG’s assertion that travel in the province had become insecure, particularly the public transport. Earlier, the chief minister opened the two-day Urs by putting a floral wreath on the Mazar. Addressing the people at the Sachal shrine, the chief minister said Sufism and mysticism were the heart of Sindh and during the period of Sufis, peace and tolerance ruled the land. As against this, he added, terrorism, gun rule and Kalashnikov culture brought miseries to the people.Qaim said people in every part of the world had particular affection to books and music. He said Sufis had converted this affection into love and towards greater peace of mind of the people through their special tone and rhythm. Qaim said in their poetry, the Sufis did not discriminate among people and enthral everyone with their message of love. He said it was the same rhythm that had inspired the lives of Shaheed Zulfiqar Ali Bhutto and his daughter Shaheed Benazir Bhutto and they laid down their lives upholding the dignity of Sufi land. 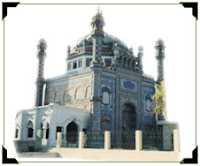 The chief minister announced a grant of Rs 500,000 [USD 6058.--] for the Sachal Yadgar Committee and constituted an special inspection team to monitor development work in and around the shrine. Qaim also gave away awards to Sufi singers, writers, poets and others. The chief minister also laid the foundation stone of the Sachal Complex.